Virgen del Carmen - the patron saint of fishermen, and a special Fiesta on the southern coast of Spain. 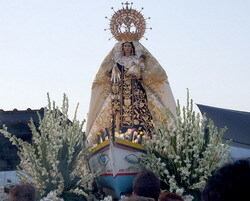 On the evening of July 16, in the fishing villages and towns up and down the Coast, the much-loved effigy of Virgen del Carmen is not only paraded through the streets but also taken for a spin round the bay on a flower-adorned boat, accompanied by a flotilla of "jábegas" (fishing boats) - which are blessed for the coming year in the process. Brass bands play, crowds clap, rockets shoot off and fireworks fill the late dusk sky. Here is a selection of scenes from the event. The photo gallery shows the boats going out to join the flotilla, and then the boats returning with the Virgen on board - and the ensuing parade. View slideshow.